Humankind's awesome fascination with dreams and the occult is ageless. 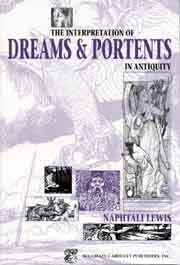 Between the covers of The Interpretation of Dreams and Portents in Antiquity, readers will find some of the earliest examples of this fascination. Collected for the first time are translations of some of the basic works used by ancient seers. Here, in their own words, are their interpretations of dreams, unraveling of signs, and their views on the significance of many kinds of unusual occurrences. This reprint of the 1976 Samuel Stevens Hackert & Co. edition, with a new foreword by Napthali Lewis, will be of interest to psychiatrists, psychologists, classicists, and historians of religion.